Why is Cades Cove all you could ask for? Because it has everything you look for when you visit the Great Smoky Mountains National Park- wildlife, history, trails of every variety, and the best waterfall trail in the park! So, what is a cove? a flat valley between mountains. Cades Cove was once a farming community before it became part of the Great Smoky Mountains National Park. There are more historic buildings in Cades Cove than any other area in the park. A great way to experience much of this history is to hike the Cades Cove Loop Road. It's a paved, one-way, 11-mile loop that you can shorten to 8 miles by cutting across the valley on Hyatt Lane. 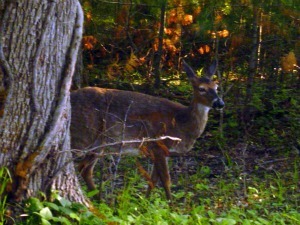 Cades Cove Loop Road is also a great way to spot wildlife, like deer, turkeys, or even bears. The best time to hike the Cades Cove Loop Road is when it's closed to cars. The road is closed to vehicles on Wednesdays and Saturdays until 10 am from early May to late September. Chestnut Top- A Top Pick for Wildflowers! Abrams Falls- The Best Waterfall Hike in the Smokies! Rich Mountain Loop- History, Wildflowers, and Views!